Should I add a lift in my running shoe to improve my symptoms? One of the greatest misconceptions in the treatment of musculoskeletal injuries is using interventions to create symmetry in the body between right and left sides. Asymmetry is often the norm vs. the exception but we function very well in life and sport with these asymmetries. Small asymmetries should be accepted while larger asymmetries should be examined and treated on an individual basis. A previous article in the NY Times highlighted the amazing performances of Usain Bolt despite having a significant leg length difference and resulting asymmetrical running gait. 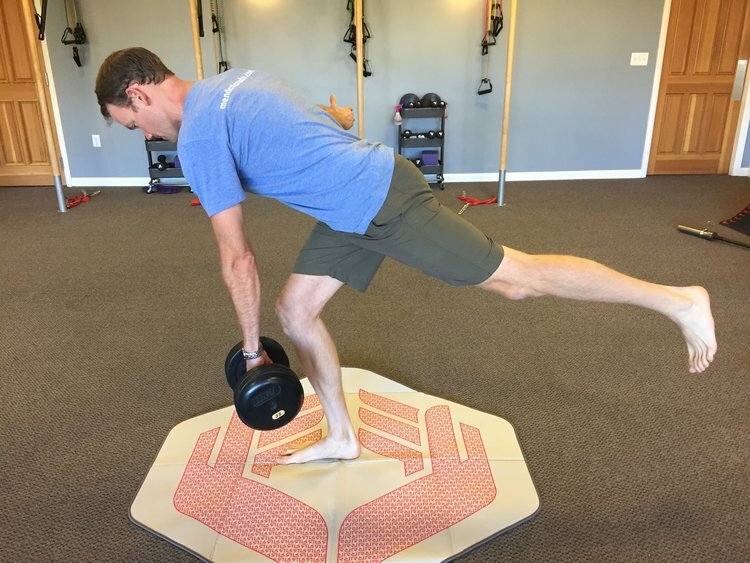 Patient's often come into our Boulder Physical Therapy practice with heel lifts based on a previous clinician's assessment and resulting intervention for a "short leg". Side Note: We will leave the ridiculousness of SI and pelvic asymmetries or functional leg length discrepancies for another post. There are two main errors with this reasoning first and foremost all clinical tests have significant false positives and negatives limiting their ability to find a truly short leg. Second, static measurements, including leg alignment, have not been shown to significantly impact running injuries. The majority of us have small differences in leg length but how much do these differences impact running injuries? A recent study in the International Journal of Sports Physical Therapy both described the incidence of leg leg differences and examined the impact of these differences on running injuries (Rauh et al. 2018). Authors screened 322 high school cross country athletes for leg leg differences and then followed them to determine if these differences increased the risk of lower body injury during the upcoming season. The authors found 1 in 5 runners had a significant difference in leg length, but these differences were not associated with future injury risk. One exception was found in athletes with a leg leg discrepancy of > 1.5 cm who were 7 times more likely to experience an injury than an athlete without a significant leg length difference. This study highlights and supports our clinical practice of removing more lifts than we put into a runner's shoes. Small differences should be accepted and left alone while large differences, > 2 cm, should be lifted on an individual basis. We have previous discussed the limitations of orthotics to control lower extremity alignment. Another common reason for orthotic use is to control the degree of pronation or flattening of the foot during foot strike in walking and running. The theory believes orthotics are able to impact force absorption by controlling this motion at the foot and ankle joints. Much of this theory is based off an "ideal" neutral position of the foot and ankle called subtalar neutral. The research into subtalar neutral is conflicting and this position may not be optimal for either static or dynamic foot function. A recent article in the Medicine and Science in Sport and Exercise journal examined asymptomatic participants with flat feet. These participants were given custom orthotics based on the sub talar neutral theory. Each participant then walked at a preferred and fast speed under 3 conditions: barefoot, athletic shoe, and athletic shoe plus orthotic. Authors measured force and EMG data during each condition. Results demonstrated the effects of reduced pronation and energy absorption were similar between shoe and shoe and orthotic conditions indicating no further benefit of orthotic use. Authors reported the benefits of reduced pronation (flattening) and force transmission were due to primarily to shoe wear. Running is one of the most popular forms of exercise due to its’ accessibility, low equipment cost, and health benefits. As running popularity continues to grow, unfortunately so do the number of runners who miss a training session or competition due to injury. These runners are not alone; as research has reported up to 90% of runners have experienced an injury over their running career. Without treatment many of these injuries can progress to persistent issues leading to lost training time. Below is a list of our Boulder Physical Therapy practice's top 5 tips to reduce the injury risk associated with running. There is no more powerful tool to reduce a runner's risk of injury than strength training. Recent research shows a 1/3 to 1/2 reduction in risk among runners who complete both strength and endurance workouts each week compared endurance training alone. Despite running dozens of hours per week, many runners are hesitant to incorporate strength-training exercises into their training programs. These athletes often cite time constraints, lack of knowledge, and risk of injury among their concerns or barriers to exercise. Runners who take the time to perform a weekly strength training program not only lower their risk of future injury, but also improve their running economy. Runner’s who incorporate strength training are able to sustain a given pace at a lower percentage of their VO2 max (maximum oxygen utilization rate) than their untrained peers. Improved running economy leaves more room in the tank for training or a sustained, near max effort during the final kick in an upcoming race. Running is one of the few sports where you can participate as an adult without formal training or skill acquisition, but form can make or break a runner's health. In our Boulder Physical Therapy Practice, gait retraining is an effective intervention to reduce the abnormal forces which precipitate or perpetuate many overuse running injuries. Athletes are videotaped and analyzed by Physical Therapists for bio-mechanical faults including alignment, stride length, step rate, and running technique. The athlete is then given real time feedback to correct the faults associated with their respective injury. In the example above, the athlete demonstrates improved pelvic stability and knee control using the real time visual and/or auditory feedback. Gait retraining treatments are gaining momentum in the scientific literature with more studies demonstrating their effectiveness across multiple running injuries. Runners are advised to work with a local physical therapist or running coach to optimize their running form. In our previous posts on running shoes we have described the limitations of orthotics and shoe wear to alter foot, ankle, or knee mechanics during walking or running gait. Despite the hype and claims, shoes have been unable to significantly improve running mechanics compared to proximal interventions including hip strengthening and gait retraining by a Physical Therapist. The take home message from many large studies is runners have an inherent feel for the right shoe. When allowed to pick their own shoe based on comfort these runners have less injuries compared to runners who were given a shoe based off of their static or dynamic foot and leg postures during standing, walking, or running. The use of foot orthotics are commonly prescribed for many lower quarter conditions including running injuries, foot and ankle pain, and even low back pain. As we have described in our previous posts off the shelf orthotics perform as well as more expensive custom orthotics, but overall their impact on many conditions and leg alignment is limited. When compared to more active approaches including Physical Therapy and exercise, orthotics fall short of manufacturer and clinician promises of pain relief and improved function. In addition, foot muscle atrophy and weakness often result from an athlete's over reliance on orthotics. One last factor to consider in any running program involves the documentation of your weekly training volume including distance, speed, terrain, days per week, and concurrent workouts. Training errors, especially among runners with a history of injury, are common but can be avoided by not increasing your mileage above and beyond your body's ability to adapt to your workouts. Allow your body's tissues to adapt to the demands of exercise by becoming stronger, more resilient, and less likely to sustain an injury over time. In our previous posts, we have described the limitations of orthotics to correct lower leg alignment and treat foot and leg conditions compared to Physical Therapy exercises. In addition, long term orthotic users often show atrophy of the foot's core muscles which leads to further weakness and dysfunction. Instead of orthotics, an active approach designed to strengthen the foot's core muscles has been shown to have a significant impact on both lower quarter pain and function. A recent article compared orthotics and strengthening exercises to improve arch height, static and dynamic balance. Kim and colleagues randomized healthy participants to either wear an orthotic or perform short foot/core strengthening exercises (J PT Science, 2016). The exercise group performed strengthening exercises 30 minutes per day, 3 days a week, for 5 weeks. Upon re assessment, the foot strengthening group was superior to the orthotic group on arch height, static and dynamic balance assessments. This study adds to our existing research supporting the foot's need for both mobility and strength, not rigid orthotic supports. The use of foot orthotics are commonly prescribed for many lower quarter conditions including running injuries, foot and ankle pain, and even low back pain. As we have described in previous posts off the shelf orthotics perform as well as more expensive custom orthotics, but overall their impact on many conditions is limited. When compared to more active approaches including Physical Therapy and exercise, orthotics fall short of manufacturer's and clinician's promises of pain relief and improved function. A recent study out of the University of Wisconsin examined the impact of off the shelf orthotics on running mechanics (O'Conner et al. JOSPT. 2016). Authors studied 31 recreational runners in a biomechanics laboratory while running with or without a foot orthotic. In particular, the authors were interested in the amount of dynamic foot motion at the heel and mid foot during the stance phase of running. Runners were then grouped based on the amount of motion in their feet during running. They hypothesized that runners with the greatest amount of motion may benefit most from the orthotic. The results of this study show that orthotics did not significantly impact motion at the hip or knee and thus the use of orthotics based on a patients degree of foot and ankle motion is not supported. Athletes are advised to understand the limitations of orthotics to change lower quarter running mechanics and instead work with a local Physical Therapist to correct these running mechanics.